Australian Bell was incorporated in 1998 in order to undertake the Melbourne International Festival of the Art's 'Federation Bell' commission. Australian Bell uses the best technologies available to expand the possibilities for the design of bells, tuned percussion instruments and musical sculptures.The director of Australian Bell, Dr Anton Hasell, collaborated with Dr Neil McLachlan to design and create the unique 'Federation bell Installation', an interactive public-space carillon to celebrate the centenary of Australia's Federation in 2001. Together, and in collaboration with many talented individuals, they developed and invented processes to design, cast and tune new musical bells, including the single pitch 'harmonic' bell which is an invention protected by a US patent.Australian Bell pty Ltd continues to seek opportunities to design innovative musical instruments and public-space sound-sculpture arising from its ongoing research into the science and the art of the design of bells. Adjunct Professor, Spatial Information Architecture Laboratory, RMIT University. Anton Hasell has been a professional Artist for twenty five years with a strong interest in sculpture, including sound-sculpture. and printmaking. He is fascinated with, and his work explores the outcomes from, combining the most recent digital design technologies with the ancient and traditional art-craft processes. This is apparent in the new musical design of the bell as much as it is in his laser-cut relief printmaking process. His education includes a B.Economics & Dip Ed (LaTrobe University), B. Fine Arts (RMIT University), P-G Dip Fine Arts (V.C.A) and a Master Fine Arts (V.C.A). He completed a PhD, by thesis, in the Architecture and Design Department of RMIT University in 2002. Anton's Ph.D thesis 'Multi-Sensory Sites of Exprience' researched the experiential functions of pre-secular societies with their uses of bells and other sensory stimuli, in both Eastern and Western communities, promoting communal identity, and from this work proposes a new sensory approach to public-space design to stimulate communal sensitivities in our secular and individualist societies. The 'Federation bell Installation' was designed within this research paradigm. Anton has an exhibition history of numerous group shows including twelve one-person exhibitions. Anton has completed twenty public-space sculpture commissions between 1989 and 2008. has been awarded a VA/CB studio residency at Paretaia, Italy in 1988 and Artist-in-residence at James Cook University in 1994. Anton has lectured part time in sculpture at the major tertiary art schools in Victoria, including eight years at the V.C.A. Over the past five years he has, in particular, undertaken research into the physical behavior and musical possibilities of ancient Chinese Nau bells and their place in contemporary urban public-space design. Anton has maintained his studio art and bell-foundry since 1983, and has developed an expertise in the casting of bronze sculptures and tuned bronze bells. This has been aided by having travelled extensively to the major art foundries in Europe and the U.S.and to all of the important bell foundries in Europe and Asia. Anton lives with his wife Georgina and two children, Samuel and Matilda, in a bluestone house and studio they built themselves at Mia Mia, Central Victoria. The 'Sound of Speed' project is a collaboration with Terrence McDermott as part of the City of Melbourne's Laneway Commissions. Six Nau (ancient Chinese two tone bells) are positioned along David Jones wall in Union Laneway. These bells are tuned across an octave and they ring in an interactive response to the movement of people through the Laneway. Two overhead video cameras stream the movement of people as data to a computer. The patterns rung by the bells is in response to the particular movement of people along the site.. The Horsham Campanile. The Rural City of Horsham commissioned Australian Bell to bring its old 1890's iron Post Office Bell into its public space and use. 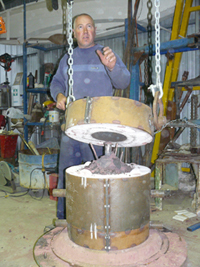 A sister bell was designed by Australian Bell and cast at CMI iron foundry in Horsham in October 2008 and this bell will be installed in the campanile to connect the bell from the City's past to contemporary life in Horsham. A Petit & Fritsen electronic ringing system is being used to operate the bell. The City of Darwin celebrates Charles Darwin's 200th birthday in Febuary 12 2009 and has commissioned Australian Bell to design, cast and install a bell installation in 2009. The 11 bells tuned over 2 octaves consist of 6 traditional European bells and 5 conical Asian style bells with the same partial frequency array as the traditional European bell. The central bell in the chime is a replica HMS Beagle ship's bell cast in brass. Australian bell and its director Anton Hasell have undertaken many public-space commissions including the Federation Bells (federationbells.com.au), the Victoria Police Memorial in St Kilda Rd Melbourne, The Eureka Circle installation at the Eureka Centre in Ballarat, the Tilly Aston Bell in the Domain Gardens near the MYer Music Bowl to celebrate the centenary of Vision Australia and the 5 metre cast bronze fountain at 209 Kings way Melbourne. Alex is a consultant to Australian Bell to build the high precision sand moulds. Alex is a master potter and sculptor in his other life and has the patience and skill required to mould resin sands to within the tolerences required in casting harmonic and other musical bells. Behzad has been employed by Australian Bell to work on the computer modeling of vibration and shape optimisation. His extensive research experience in engineering has been invaluable in both the bell design processes and the conceptualisation of the physical behaviour of bells. Behzad is lecturing and doing his PhD on satelite tether systems in the Department of Aerospace Engineering at RMIT. 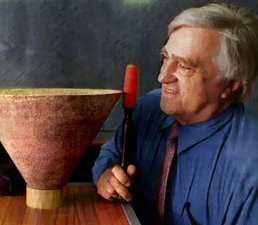 Professor Josef Tomas has been a critical and enthusiastic supporter of the work of Australian Bell. His software has allowed Australian bell to invent a number of new musical bells.